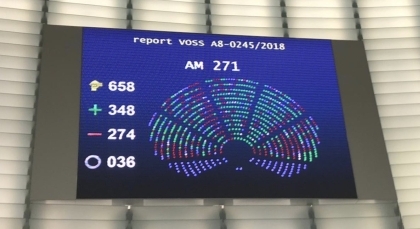 The European Parliament passed the Directive, unamended, by 348 votes to 274. Thanks to all who contacted their MEPs. Please contact your Members of the European Parliament via social media urging them simply to adopt the Directive (with any possible improvements) using the hashtag #Yes2Copyright. You can find details of your MEP here. You could link to Manifesto for an open and fair internet too. THE BATTLE over the European Union's plan to strengthen copyright in some ways is, of course, heating up. The NUJ issued a statement saying the Directive "makes a mockery of journalists' authors' rights" after late and unclear changes cast doubt on which journalists could get a share of any income newspapers get from the likes of Google News (see www.bit.ly/2SUIMsf). THE Internatonal Federation of Journalists snd the European Federation of Journalists have issued a joint statement urging members of the European Parliament to adopt the "Copyright Directive and any possible improvements". The statement notes that since the Directive was first introduced "both journalists' federations have worked jointly and tirelessly, supporting the proposal and working to improve it. The federations continue to seek improvements and clarifications in the lead up to the crunch vote on its adoption this month." Thanks in part to that work, it "includes important provisions for the creative and media industries and for authors. It offers the publishing industry and journalists a share of the revenue their work generates online (Article 11), introduces the principle of appropriate and proportionate remuneration for authors (Article -14), key transparency obligations, alternative dispute mechanisms and the possibility for authors to be represented by their unions (Articles 14-16). Member States shall provide that the authors of the works incorporated in a press publication receive an appropriate share of the revenues that press publishers receive for the use of their press publications by information society service providers. The Directive makes sure that every journalist will benefit from protection in his or her contractual relationship with publishers across Europe. Work continues in discussion with publishers' organisations on guidelines for the implementation of the Directive in EU member states to ensure that this happens. ...since the European Parliament voted overwhelmingly on Sept. 12 to approve its version of the Copyright Directive, YouTube has been actively using its own services to influence public opinion, often with misleading or false information. send a message to the same YouTubers so we can share with them our vision of article 13 - the one we promote on our website, www.article13.org. We find no trace of this happening. As noted above, the Directive passed the European Parliament unamended. See below for a final statement from the International Federation of Journalists.